The Coin-Op brother-sister art duo of Peter & Maria Hoey is well-known for their fastidious approach to their comics' aesthetics. Their smaller-run comics, the "45 rpm" line, both mimics their fascination with music in terms of form and content. They are designed to look like sleeves for 45 rpm records, best known as short-playing records with a single song on each side. The comics also are a mix of music history and something else. 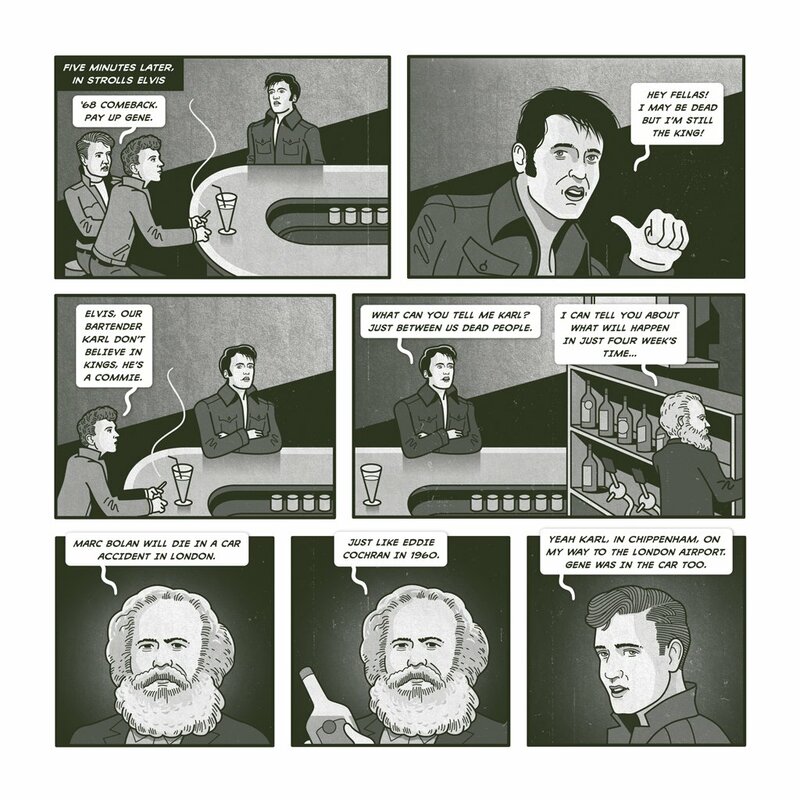 In the case of Karl Marx Bolan, it imagines an afterlife where rockers Gene Vincent & Eddie Cochran conspire with Karl Marx to change the world. The Hoeys have the uncanny ability to draw naturalistic caricatures of famous people without losing any expressiveness; indeed, they lean into the caricatures to emphasize their larger than life qualities. 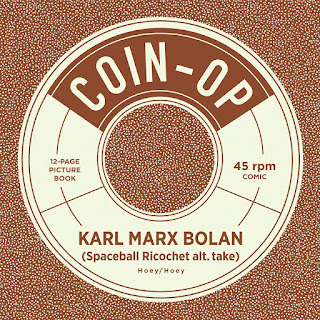 The story follows Marx using the event of Elvis Presley's death as a distraction in order to send Vincent and Cochran to save Marc Bolan. He claimed that "We need a working class hero who knows how to boogie! 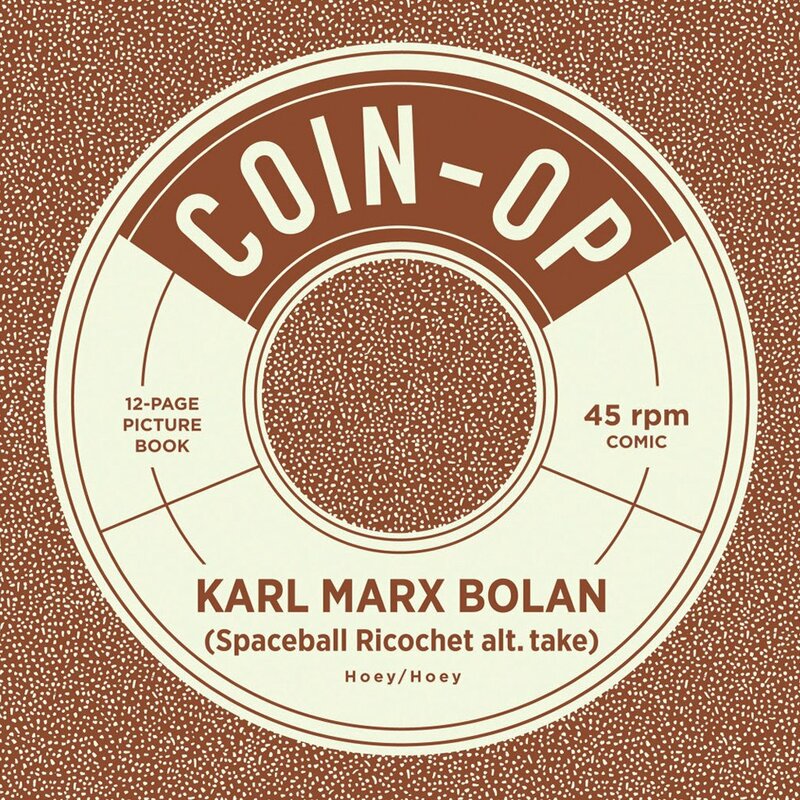 ", and Bolan's music destabilizes the Soviet Union and leads to crushing defeats of Margaret Thatcher and Ronald Reagan. 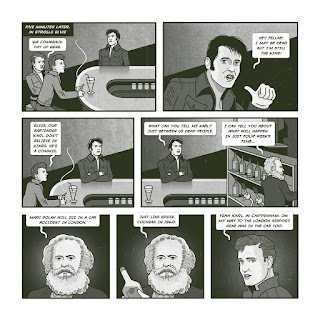 What makes the comic so much fun is the way that the Hoeys are so obviously conversant both in Marx's political ideas as well as the stories of each rock star. In just eight pages, they tell a story with an epic sweep that touches on raw early 50s rock, 70s glam rock and funk. It's a funny statement about the potential power of music apart from its status as capitalist commodity. The whimsical qualities of the comic are grounded by its naturalistic approach and roots in reality, but at heart it's still a fun bit of subversiveness. I've got the HC collection of Coin-Op because I was intrigued by your previous reviews of the minis, but I haven't made time to did into it yet.